A respectful person treats people well. It’s the best example of how they want to be treated. They are well-mannered, polite and considerate of others. 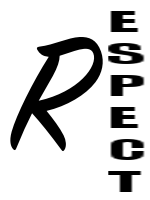 Respect offers the potential for making more friends and having better relationships. It also helps to create an environment of peace and harmony. A person who respects themself aspires to be a better person through exercise and eating healthy, constant learning, and by doing the things they love. Help your child earn their Respect badge this month!